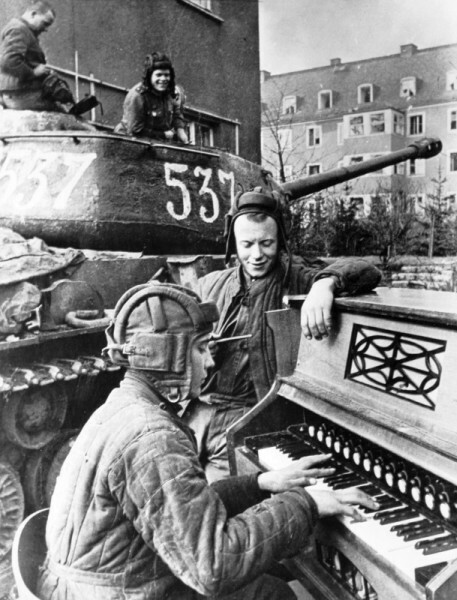 Following the conclusion of the Great Patriotic War, the peace-loving peoples of the Soviet Union set about rebuilding after the destruction caused by the Nazi invasion. Despite bearing the brunt of the burden of defeating Hitler’s forces, the USSR received only niggardly assistance from the West — the capitalists focusing on squeezing even more gold from the proletariat. Thankfully, the workers and peasants of the newly liberated regions recognized the righteousness of the Communist Party’s ideology and replaced their decadent bourgeois leaders with true proletarian patriots. The people worked tirelessly to rebuild the agricultural and industrial might of the Soviet Union and their allies as well, despite outside meddling from the West. And while the industrialists of America, France, and Britain sent their soldiers home to slave in the factories, again making the owners rich, Mother Russia kept most of her men in uniform to guard the frontiers with vigilance against the next coming of imperialism. For it would come, and this time the Red Army would fight the enemy on its own soil, crushing them, and liberating their peoples from their capitalist oppression. Under the leadership of “Papa” Stalin, the brilliant Soviet scientists and engineers continued to evolve the arms of war. The T-34 and Joseph Stalin 2 tanks, mainstays of victory over the Nazis, were refined into ever more powerful variants. Rapid-firing rifles were invented by Mikhail Kalashnikov, twice Hero of Socialist Labor and winner of the Stalin Prize, and distributed to the brave defenders of the Rodina (Motherland). The harsh lessons of war were retained and taught to new men in uniform. They studied and practiced armored breakthrough and exploitation, the power of massed artillery, and the utility of close air support to combined arms combat. Meanwhile, in Europe and Korea, and wherever else Communism flowered, the West showed their true attitude toward “freedom and democracy” by attempting to suppress the people’s movement. The day might come when those provocations would prove too much to endure, but the defenders of the people would be ready. In Hammer and Sickle, politics between East and West will reach a boiling point. Because we have modified the historical events, the Soviet Union and her allies will touch off the Cold-War-Gone-Hot that thankfully never occurred. One might ask: “Why Germany?” Because, as Soviet Foreign Minister Molotov once said, “What happens to Berlin, happens to Germany; what happens to Germany, happens to Europe." Another question might be, “Wouldn’t this fight go nuclear?” It is our belief that the explosion of the first Soviet atomic bomb gave the West pause to consider what they might lose if the fight were to escalate to nuclear weapons. Unless the very existence of the nations of the West were at risk, the recent memories of the London and Coventry bombings, and how those might compare if nuclear rather than conventional bombs were used, would have deterred Clement Atlee or Winston Churchill from using atomic bombs. Truman, after seeing the results of the bombs he dropped on Japan, may have also reconsidered. It seems like the Western powers would not wage nuclear war over possession of Germany -- the cost had to be managed. In the scenario background we have built, a number of historical events and actors have been changed to present a “might have been.” In this case, the Soviet Union, angered by Western activities they view as antagonistic to the best interests of the USSR and her allies, has launched the full power of her armed forces to expel the Western allies from Germany. The ultimate goal is to give the USSR more control and influence over Europe, create an even deeper protective zone around her borders, squeeze the remaining productivity out of Germany, and diminish the power of the now ascendant United States. The headquarters of the Soviet 11th Tank Corps, 8th Guards Army, resides only about 280 kilometers from the American airfields at Frankfurt am Main and another 30 kilometers to Wiesbaden. From there, the Soviet tanks need only drive a further 140 km to reach the French border at Saarbrücken. Can the Americans stop the Soviets at the Fulda Gap? Can they stop them at all? Try your skill in the campaign game. Launch the Red Army, both Guards and the Army of Workers and Peasants, in their struggle to overcome the American defense and destroy the irritating US Air Force on the ground. But will your supply line that continues to lengthen as the Western one shortens, be your undoing? Or, if campaigns aren’t your style, select from 20 opportunities to fight a “might-have-been” scenario across the German war front as we think it might have unfolded. • April 23, 1945. On the outskirts of Berlin Field Marshal Georgi Zhukov, twice a Hero of the Soviet Union, is killed by a German sniper. Marshal Vasili Chuikov assumes command of 1st Belorussian Front. • April 30, 1945. Adolf Hitler commits suicide. • May 7, 1945. Unconditional surrender of all German forces, Victory in Europe (VE) Day. • May 23, 1945. Stalin appoints Marshal Ivan Konev as first commander of the Soviet Occupation Zone in Germany. General Eisenhower is his counterpart for the Americans. Eisenhower and Konev do not get along. • June 5, 1945. Allies divide up Germany and Berlin and take over the German government. British, French, and American demobilization begins. • June 26, 1945. United Nations Charter is signed in San Francisco. • July 1, 1945. 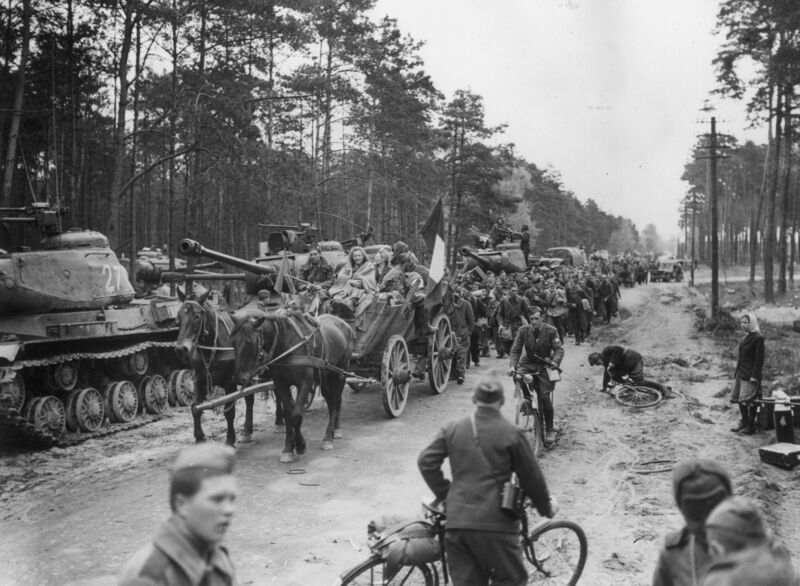 American, British, and French troops move into Berlin. • July 16, 1945. The first US atomic bomb test. • July 17 - August 2, 1945. Potsdam Conference decides borders of Germany, war reparations, and governance of Germany and Poland. • July 26, 1945. Churchill defeated by Clement Atlee in the first British vote for Prime Minister in ten years. • August 6, 1945. The first atomic bomb is dropped on Hiroshima, Japan. • August 8, 1945. The USSR declares war on Japan and invades Manchuria. • August 9, 1945. The second atomic bomb is dropped on Nagasaki, Japan. • August 14, 1945. The Japanese agree to unconditional surrender. • September 2, 1945. The Japanese sign the surrender agreement; V-J (Victory over Japan) Day. • January 1946. Several protests occur among US soldiers in Europe over delays in demobilization. The protests are controlled, but demobilization picks up the pace under Presidential direction. • July 26, 1947. The US National Security Act creates the CIA, the Chiefs of Staff, and makes the United States Air Force a separate service from the Army. • October 1, 1947. The first F-86 jet fighter takes flight. The aircraft enters service in numbers in 1949. • March 25 1948 - May 12, 1949. The Soviets issue orders restricting Western military and passenger traffic between the American, British and French occupation zones and Berlin (known as the Berlin Blockade). The Americans continue to supply their forces by military train until the trains are halted, then by air. • April 1948. The Marshall Plan begins (officially the European Recovery Program, ERP), a large-scale American program to aid Europe to rebuild their economies, remove trade barriers, modernize industry, and prevent the spread of Soviet communism in the West. The USSR and Eastern Bloc countries decline and form their own economic union, reduce border transit, and increase security. • June 20, 1948. The Deutsche Mark is introduced to stabilize the German economy, but USSR sees it as an attempt by the West to control the German economy. • December 31, 1948. The first MiG-15 jet fighter takes flight. The aircraft enters the force in numbers in 1949. • January 8, 1949. The USSR and allies form Council for Mutual Economic Assistance (COMECON). • August 29, 1949. The Soviet Union explodes its first atomic bomb, RDS-1. • October 7, 1949. The German Democratic Republic (East Germany) is established, headed by the Socialist Unity Party. • 1950. The USSR establishes 46 Soviet Special Forces (Spetsnaz) companies. • June 25, 1950. The Korean War begins, fought over Korean unification with North Korea aided by the People’s Republic of China, and South Korea by the United States (and some allies). • July 1, 1950. Soviet Border Guards open fire on an American truck convoy allegedly trying to evade proper inspection. American Army Security Forces open fire in their defense. Casualties are three Soviets dead, six injured, two Americans dead, five injured. Both countries call for sanctions in the UN, and both veto the contending resolution. • November 3, 1950. A two-ship of Soviet Yak-9 fighters enters West German airspace and encounter a four-ship of American P-51s. The US alleges the fighters refused to turn back when warned, and fired first. The Soviets claim the intrusion was unintentional and the Americans fired without warning. Result: one Yak shot down, one damaged but returned. Again, both countries file grievances in the UN and veto each other’s resolutions. • December 1950-September 1951. Espionage and counter-espionage reach new peaks. At least 16 agents of the CIA, MI-6, and KGB are killed or reported missing. • September 24, 1951. The USSR tests a second atomic bomb. • October 7, 1951 Three leading Russian nuclear scientists are found shot dead. The Soviets blame US and British intelligence personnel, though no proof is forthcoming. • October 8, 1951. Stalin authorizes selective activation and forward movement of combat units in East Germany and surrounding countries for a preemptive attack to wrest Germany from Western control. A cover military exercise is quickly planned and announced to mask the activity. • October 19, 1951. US and British intelligence detect signs of an impending attack. The British are in the middle of elections (on the 26th Churchill defeats Attlee) and Attlee waves it off, but Churchill convinces military leaders to take defensive action. Truman directs the same, but the force levels in Europe are dangerously low and at a poor state of readiness. Some transfer of forces from Korea set in motion. • October 24, 1951. Soviet Spetsnaz forces infiltrate Berlin and other key border crossings into West Germany. • October 25, 1951. At 0300 hours, Soviet ground forces begin their attack along four avenues into West Germany, while all other forces in Europe and Asia stand at alert. The first wave is preceded by a massive artillery and air attack along the axes of advance. Those axes are: northwest toward Hamburg/Bremerhaven (2nd Guards Tank Army), east toward Hanover/Essen (3rd Shock Army), west/southwest toward Frankfurt/ Saarbrücken (8th Guards Mechanized Army), and southwest toward Nuremburg/ Munich (1st Guards Tank Army). World War 3 has begun. Can you prevail, planting the Hammer and Sickle flag on the banks of the Rhine? The Cold War has turned hot! Fight its battles with Iron Curtain: Hammer&Sickle.